Karin McQuillian Writes "What I Learned in the Peace Corp: President Trump Was Right"-Authorship Confirmed! - Truth or Fiction? Karin McQuillian Writes "What I Learned in the Peace Corp: President Trump Was Right"-Authorship Confirmed! Karin McQuillian Writes “What I Learned in the Peace Corps: President Trump Was Right”-Authorship Confirmed! 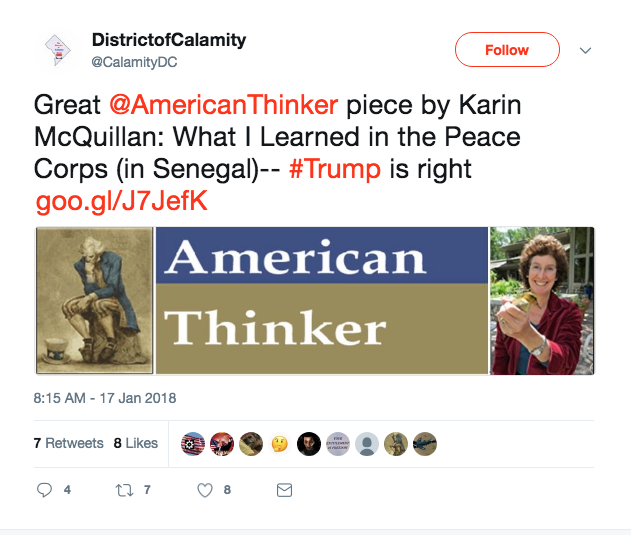 The American Thinker published Karin McQuillian’s essay under the headline, “What I Learned in the Peace Corps in Africa: Trump Is Right,” on January 17, 2018. McQuillian’s essay followed news that President Trump asked, “Why are we having all these people from shithole countries come here?” during bipartisan discussions on an immigration deal. The president reportedly singled out African countries, as well as Haiti and El Salvador, in his remarks. Mark Zuckerberg Retires from Facebook in 2018-Fiction! Donald Trump Imposes 30% Tariffs on Solar Panel Imports-Truth!